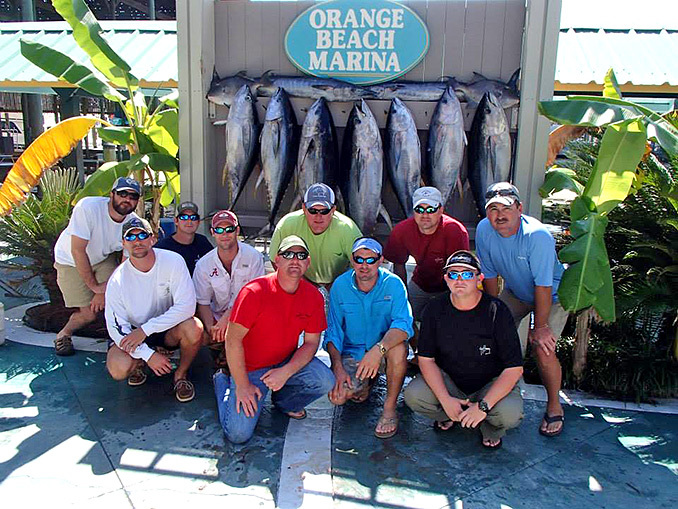 These are very productive offshore deep sea fishing trips and have quickly become one of our most popular sportfishermen trips that can be customized to fishing styles or an individual’s needs. We are very diverse and can offer you a whole range of opportunities or angling possibilities. 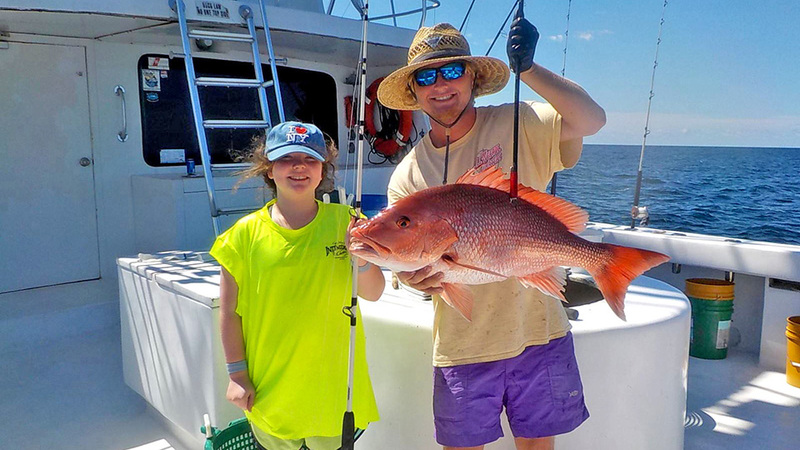 We specialize in overnight trips, but offer trips to 4 days for the ones who just cannot get enough offshore deep sea fishing. A typical overnighter usually leaves the dock about 6 am. 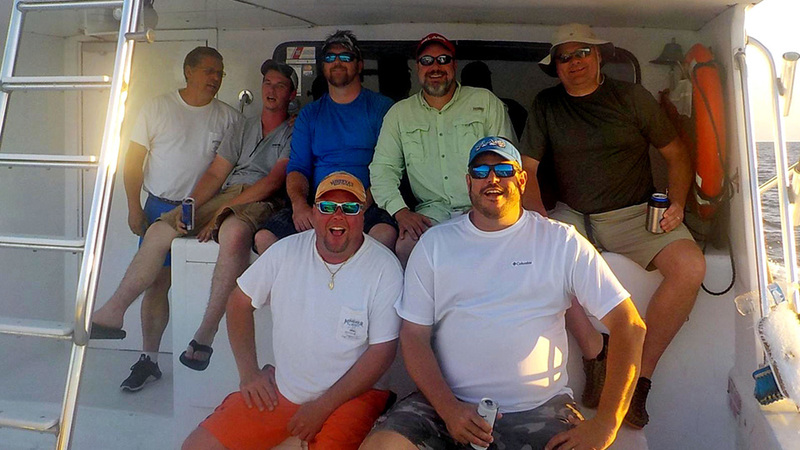 Most of the overnight trips that we run are combo bottom / offshore deep sea fishing trips. We will start the day in some cases doing some live bait fishing. 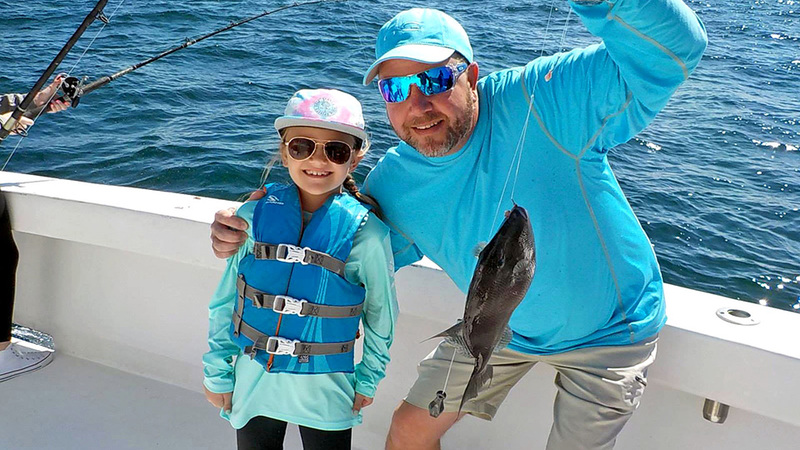 We will always make every attempt to catch all the live bait that we need before departing in the morning, it is always best to try and catch some fresh live bait just off the beach in about 20 feet of water. Most of the live bait that you will find in the “Intimidator’s 350 gallon live well” will be Pinfish, Croakers, Pig Fish and Menhaden. The bait that is usually caught in the gulf the morning of the trip will be Pilchards (aka Greenies or Elvis’), Herring, Thread fin’s, Cigar Minnows, and Atlantic Bumper fish (aka Crazy fish). 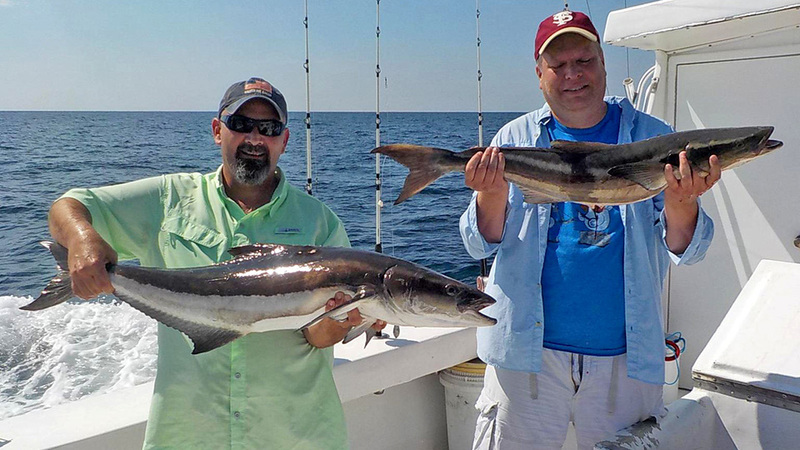 The live bait can be the most important key to most any trip so the time spent here will be well served. 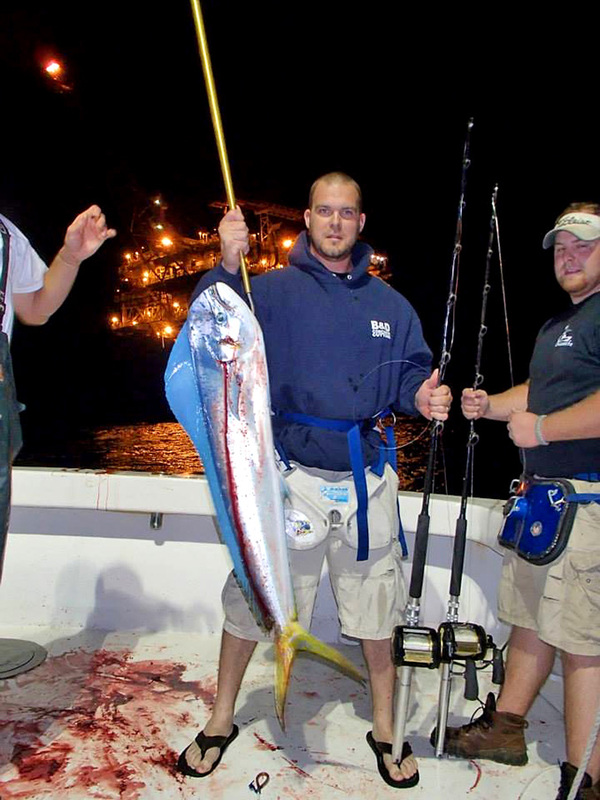 After we finish live bait fishing, we will usually put out some hi-speed trolling lures for Wahoo, King Mackerel and other fish that can be caught trolling while on the way to the fishing grounds. At this point, we will usually be working on whatever type breakfast that you may like to bring along. From there it is a flurry of activity rigging tackle, cutting bait, and giving everything a thorough inspection before the action commences. 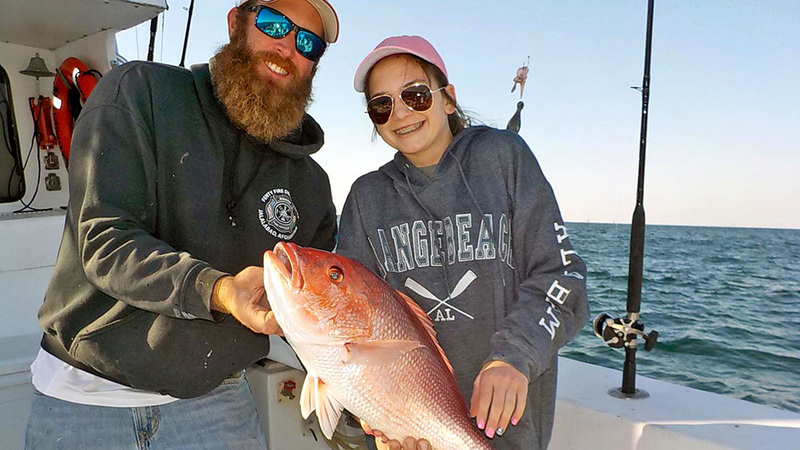 After a good ride offshore, we will start on our bottom deep sea fishing for Red Snapper, Grouper, Scamps, Vermilion Snapper and Triggerfish depending on the time of year that you go fishing. 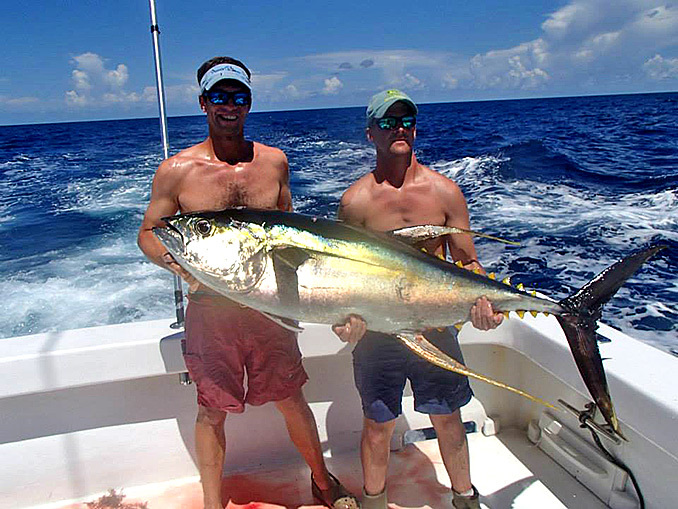 This type of offshore saltwater fishing will be done on one of the thousands of private reefs or on some natural bottom that has taken years to acquire. 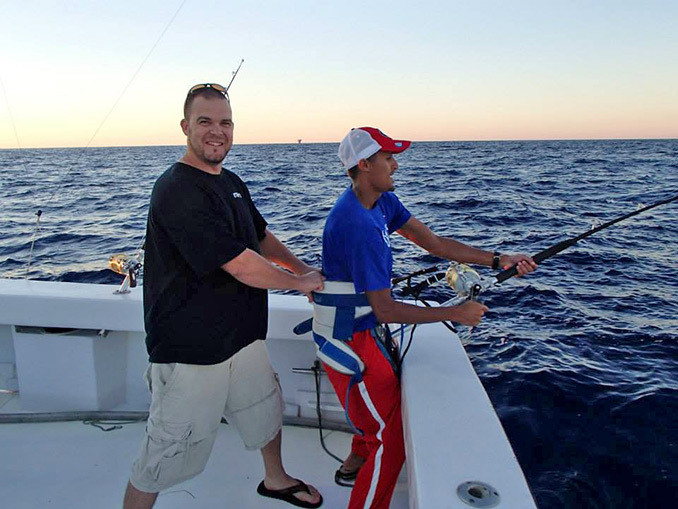 Usually everyone is fishing at once, and this creates a lot of fun and excitement in competing with the other sportfishermen aboard and just having a good time. 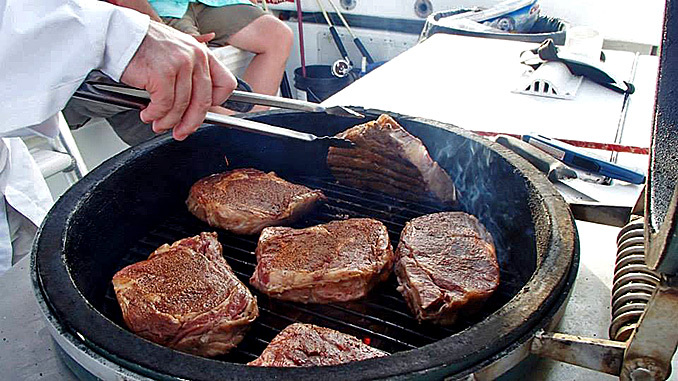 While all this is going on, it is commonplace to have your lunch smoking away on the grill. 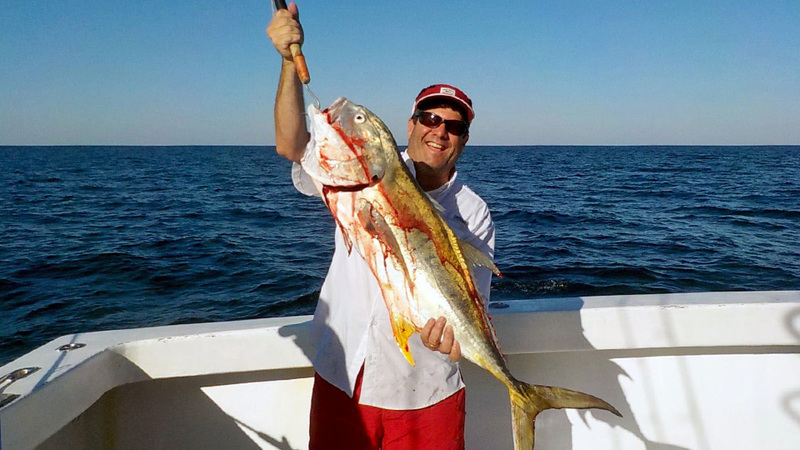 At the conclusion of the bottom fishing we will usually work our way further offshore to give everyone time to eat lunch and catch their breath to fish around some of the many oil rigs or deeper rock and chase the Amberjacks or maybe deep drop for Grouper or Tilefish. From here we can continue even further offshore to give the Tuna, Wahoo or Dolphins a shot late on the first day. 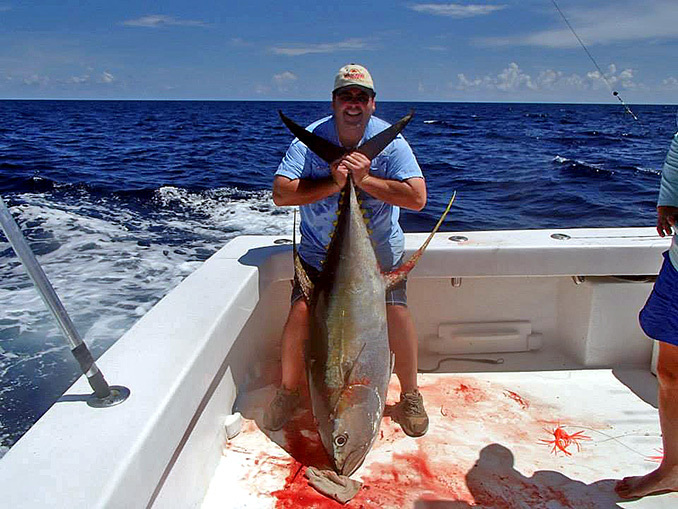 On the way offshore, we will start cooking supper and with our focus shifting to the offshore deep sea fishing for Yellow-fin Tuna, Black-Fin Tuna, Dolphin, Wahoo and the occasional Marlin. 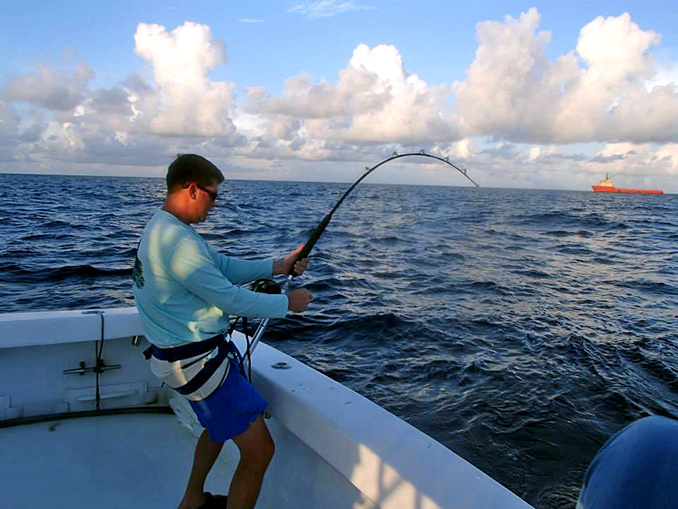 Once the offshore fishing has begun, we will employ a number of successful tactics and have three very distinct but different times for catching fish. 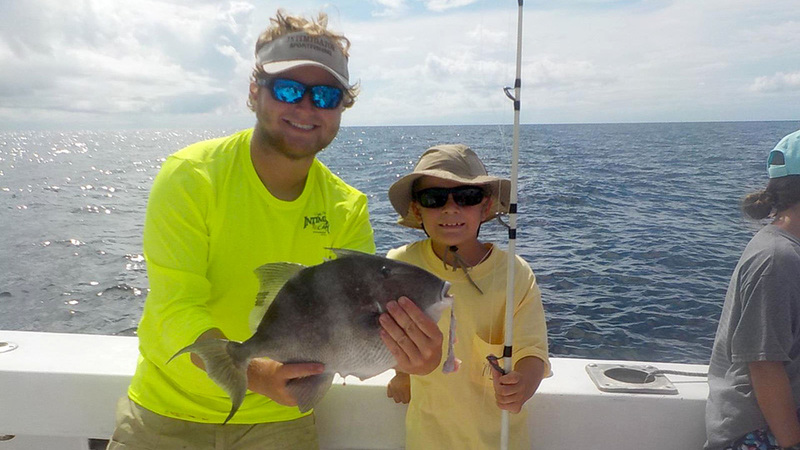 First, is the evening bite which may be done a number of ways but Trolling or Kite fishing with live bait have proven to be the best effort for Sportfishermen in this time frame. After the sun goes down and everyone is enjoying their dinners, we may try to deep sea jig some Black fin Tunas or possibly try to chum up a yellow fin right under the boat if the conditions will allow. 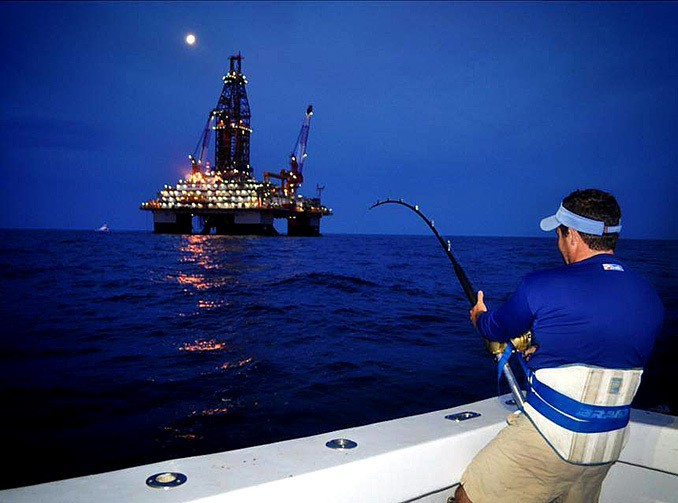 As serious sportfishermen, it is not uncommon for us to fish well into the night. With the new water maker onboard there will be enough water for a hot shower. 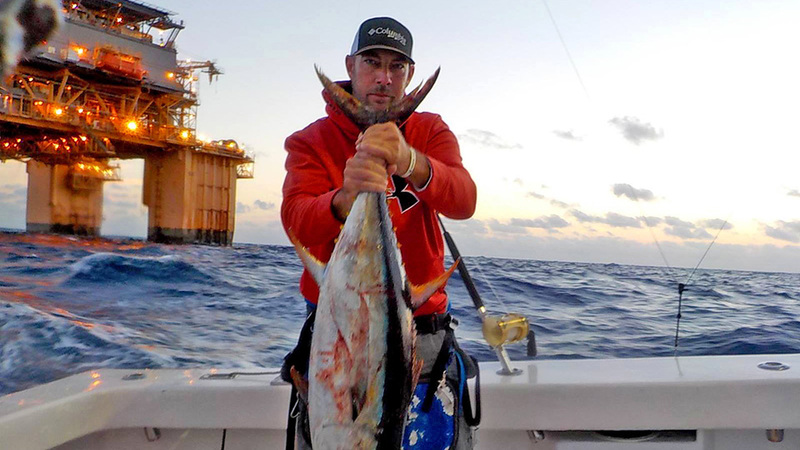 Early the second morning before the sun comes up, we usually try some more deep jigging and chunking for the Yellow-fin’s until right at the crack of daylight and then we may either go back to the Kite or trolling methods. As the sun comes up, it is a very exciting time to be on the deck with the anticipation of the “Big Bite” at any moment. If the bite is productive we will certainly stick with it until the bite slows or it is time to head back in. 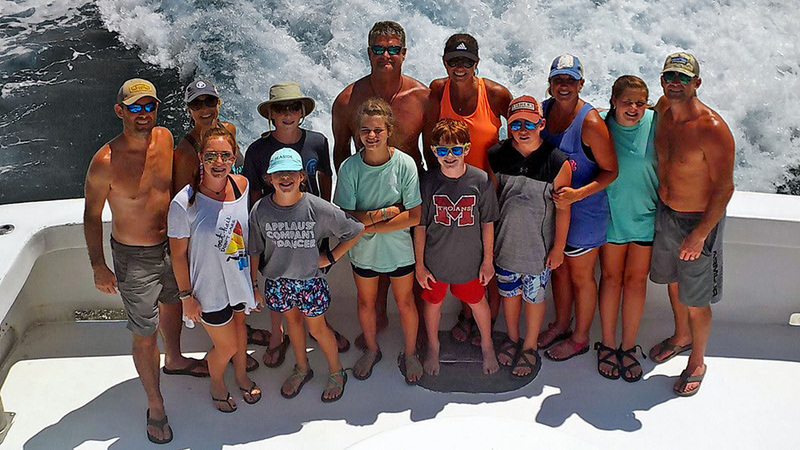 This will always be our longest ride of the trip but after a very exciting offshore deep sea fishing trip and all the fun, this is when the card games and Satellite TV will come in useful. However, most people will sleep all the way to the dock. Most trips return to the dock after lunch anywhere from 12-4 pm depending on the length of the ride. 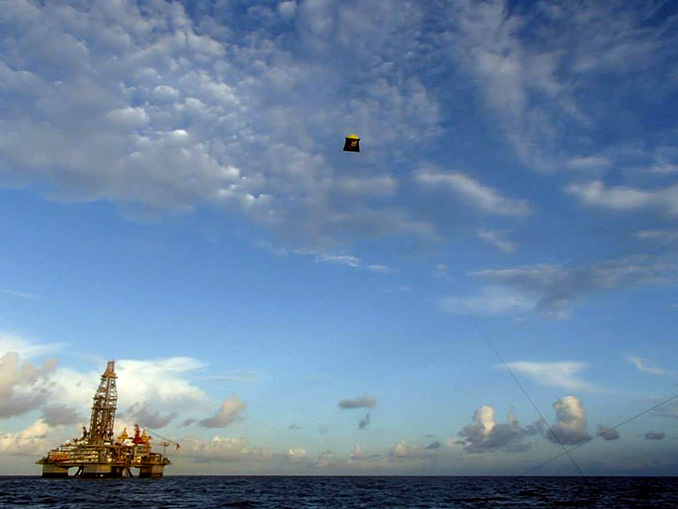 Some of the trips offshore will carry you to points well offshore - some as far as 75 to 150 miles from port. No two trips are ever the same and there is always some fun and exciting things to do on a trip like this that will set it apart from others. Nowhere else will you find a camping trip, fishing trip, and picnic like this!